When you’re looking for quality light systems, you want great coverage, LEDs that will last for years, cool systems and a wide light spectrum. Many others have taken on the task of reviewing the Kind LED systems, but we’ve gathered the information you care about. Read on to find the Kind LED system that is best for you and your plants, or maybe you’ll learn that Kind LED isn’t for you. Kind LED is a company that designs, and manufacturers LED light systems in America. The company uses Santa Rosa, California as their base of operation and works to ensure that their customer service is almost always available. This company calls Santa Rosa, California home. Initially, the founders used HID’s but eventually they came around to the LED concept. They collaborate with regular professional growers and are constantly on the lookout to find out what features are useful, and which aren’t. Unfortunately, not all of their claims are backed by performance. The Kind LED systems are meant for professional growers. They run cooler than most other systems and are fairly energy efficient. However, they don’t eliminate your electrical use by half, and there’s a whole lot of work to put into your plants if you want to increase your yield. There are 3 favorite lines from Kind LEDs many products. They’re the K3 Series L600, K5 Series XL750, and the K5 XL1000, all of which offer a lot of value, and outstanding performance. The K3 Series L600 use current optimization to shine brighter and increase the light wavelengths that most closely simulate the natural sun. The system uses a 12-band spectrum with 3-watt diodes. With quiet fans, and large heat sinks the system stays cool. With large fans, it’s important to take extra caution with the amount of water in the vicinity as it can lead to an increase in humidity. The K3 Series L600 will cost you upwards of $600, but it’s probably the best PAR for the price in the Kind LED line. As you can imagine the K5 Series XL750 is larger than the K3 Series L600, however bigger isn’t always better. But, this series is where the 5-watt diodes come into play. The K5 Series XL750 also has 3 ranges of the spectrum to help photosynthesis. The lights are dimmable and are easily intensified. Another addition to the K5 Series XL750 is the second optical lenses with increases the intensity and focus of the lights. The price increase from the L600 model isn’t completely reasonable though. This system is a top of the line Kind LED product. Designed for professional growers to cover a 5’ by 5’ area, the K5 Series XL750 is large and powerful. It mimics the sun and is completely customizable with the use of a remote control. It’s also programmable which is always great. Unlike other companies that offer a range of products so that hobbyists can get in on the action too, Kind LED only caters to professional growers. Many of their light systems can easily hook-up together to increase the coverage area, and the LEDs are of the best quality. However, the price you’re paying doesn’t justify all of the features. There are a lot of aspects in the K3 and K5 series models that you don’t need. We already know that warranties are important, especially with LED systems. Kind LED offers a pretty standard warranty. Kind LED will repair or replace any product defects in materials or craftsmanship for 3 years from the date you purchased the product. Things go wrong with even the best products all the time, but the Kind LED company does well to make sure that you’re not inconvenienced if it does happen. Within the first 90 days after purchase Kind LED will repair or replace your product at no cost to you. After that 90-day period runs out, you have to pay for shipping. Overall the Kind LED brand is a quality product, but they aren’t always worth the price. They standardly use 3-watt diodes, but they like to boost the price with a mixture of 3 and 5-watt LEDs. Although the 5-watt diodes are brighter this blend doesn’t justify the price increase. The lights also use a timer to simulate sunset and sunrise with infrared rays. 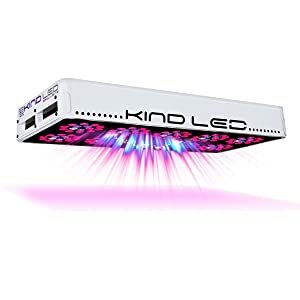 Kind LED has a wide variety of products in their lineup, and many of them are meant for professional growing. If you’re a hobbyist or growing only 2 or 3 plants at home, then Kind LED probably isn’t for you. Many people enjoy the customizable spectrum, and that the diodes re intense in various wavelengths. If you think that the Kind LED brand is best for you to check out the K5 series as they’re highly customizable.